The failure of Galaxy Note 7 last year may have come with a huge loss to the mobile phone manufacturer, Samsung Electronics. Perhaps, in that disappointment, the device maker has found the opportunity to do bigger things. It came out with Galaxy note 8 which appears bigger and is said to have capabilities that double that of Note 7. 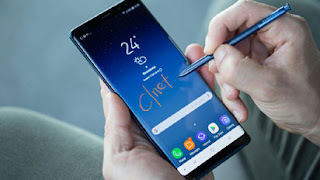 At its launch recently, Hi-Tech confronted the device makers on the failure of its last outing and the guarantee that a repeat is avoided in the obviously bigger framed Note 8. The answer was that the misfortune has given it a bigger opportunity to rule the smartphone world. Samsung claimed that Galaxy Note 8 is the most advanced smartphone in the market at the moment, based on features and capabilities. This is apparently because it comprises all the features of Samsung Galaxy S and Note series. It also debuts the dual camera, which is a first for Samsung. Smart Camera Samsung has clearly set the standard for smartphone cameras and with the Galaxy Note 8; Samsung has delivered its most powerful smartphone camera yet. The Galaxy Note 8 is built with dual 12MP rear cameras featuring a Smart Optical Image Stabilizer that counter-balances camera shake and automatically extends exposure time in poor lighting conditions, producing clean, clear shots even when on the move. While one camera has a wide-angled lens for capturing big scenes, the other has a telephoto lens with 2X optical zoom generating brighter, clearer, crisp and sharp images. With the Live Focus mode, you can freely decide how much your subject stands out by adjusting the blur and focus of the background in real-time. The background blur can be adjusted even after the picture is taken. The Galaxy Note 8 is also equipped with an industry-leading 8MP Smart Auto Focus front-facing camera for sharp selfies and video chats. In Dual Capture mode, both rear cameras take two pictures simultaneously, allowing users save both images; one close-up shot from the telephoto lens and one wide-angle shot that shows the entire background. The wide-angle lens has a Dual Pixel sensor with rapid Auto Focus, so users can capture sharper, clearer shots, even in low-lit environments. The large immersive screen always sets the Note series apart, pushing the display boundary that gives more space. The Galaxy Note 8 features a 6.3-inch screen, making it about the biggest screen on a Note device yet its narrow body makes it comfortable to hold in one hand. Made with Corning Gorilla Glass 5.0, the stunning Note 8 features an edge-to-edge display that covers nearly the entire front face of the device. The corners of the 6.3-inch glass are rounded with curved edges to give more space to write with the S Pen. The curves are harmoniously synchronized with the rounded edges to fit comfortably in a user’s hand. The physical home button usually located in the front of the phone has been replaced with a digital home button, built into the glass. The always-on display is also featured in the Note 8, showing the home button whenever the phone is locked. Built with 6GB RAM, a 10nm processor, and 64GB memory space (expandable up to 256GB), the Galaxy Note 8 offers more flexibility for internet browsing, video streaming, playing games, and multitasking. Samsung Galaxy Note 8 offers a reversible USB Type-C port and a 3,300mAh battery. With the Samsung Galaxy Note 8’s Adaptive Fast Charging technology, the phone charges from zero to 50 percent capacity in just 30 minutes. Its ultra power saving mode also lets users make the most of their battery power, helping them stay connected for longer periods. The company has also introduced a new solution called Samsung DeX, a docking station that hooks up to a display, and uses the phone’s processing power for a mobile computing experience. Users can also hook up a mouse and a keyboard to the dock, to have a much smoother multitasking job experience. The dock comes with two USB 2.0 ports, one HDMI port and a USB Type-C port and an integrated cooling fan. Users can easily choose their preferred method. Users can use the iris scanner to unlock their devices. Without having to swipe the phone. With the face recognition, you can instantly unlock your device with a look. Without the PIN or pattern, one simply has to look into the camera to lock and unlock the device. Users can also use the Secure Folder app to save important files and images. videos, and apps. Similar to the Galaxy S8 series, the Note 8 and its S Pen are IP68 certified for dust and water. Thanks to this feature which protects the device from immersion in up to 1.5m of fresh water for 30 minutes, users can capture memories at pool parties or out on the beach with loved ones or quickly jot down thoughts or ideas on a wet screen without interruptions. When wet, the device stops charging automatically to prevent short circuits. The Galaxy Note 8 extended screen is perfect for multitasking. Users can multitask seamlessly while watching a video; just open your favorite IM app along with the video player using Multi Window and text with the full keyboard without having to hide your video. While the Multi Window resizes the whole app window, the Snap Window feature will display only the selected area so you can refer to it while you are doing any other task. This is absolutely a fun feature. The S Pen replicates with ease, accuracy, and size of a real pen, allowing for a natural drawing and writing experience. The fine and precise 0.7 mm tip allows users draw and write with accuracy. With the Live Message feature, users can draw emojis, make animated GIFS or write handwritten messages on photos, making every message a special one. Users can also select a section of a video and share with friends using the S Pen’s Smart Select feature. The S Pen can also translate full sentences in foreign languages, depending on the country and region. All you need do is let the S Pen hover above the selected words. Thanks to the “Screen Off” Memo, users can write up to 100 pages of notes, as well as edit and pin them to the Always-On Display, an easy way for users to capture and share their thoughts with ease. The S Pen also automatically converts units of measurements and foreign currencies.